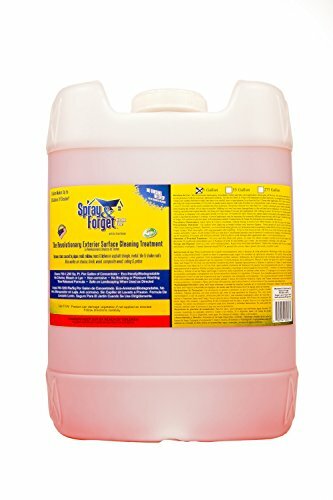 The Spray & Forget Revolutionary Roof Cleaner has a concentrated formula that cleans the exterior surfaces of your house without the need for potentially damaging pressure washing or brushing techniques. In fact, no rinsing is required. Just let mother nature do the rinsing for you! Its non-corrosive, non-caustic, non-acidic formula is biodegradable and eco-friendlly and is designed to penetrate and dissolve stains caused by mildew, mold, algae, moss and lichen from all exterior surfaces such as all types of roofs, shutters, siding, decking, fences and more. Economical - makes up to 50 gallons and cleans up to 10000 sq. ft.
Works on all exterior surfaces. If you have any questions about this product by Spray & Forget, contact us by completing and submitting the form below. If you are looking for a specif part number, please include it with your message.